Civil Aerospace Manufacturing Industry Meeting "Industry 4.0"
As one of ten fields which had been predicted as vital industries to be developed in China Manufacturing 2025, aerospace manufacturing industry was currently under in-depth revolution. Under this background, Civil Aerospace Congress 2015 (hereinafter referred as "CAC 2015") with themes like "Industry 4.0", "Intelligent Manufacturing", "Based on Technique Innovation in Aerospace Manufacturing Industry" showed status quo of China civil aerospace manufacturing industry, discussed problems and challenges to be solved in development phase, and analyzed characteristics and trend of global industrial progress. 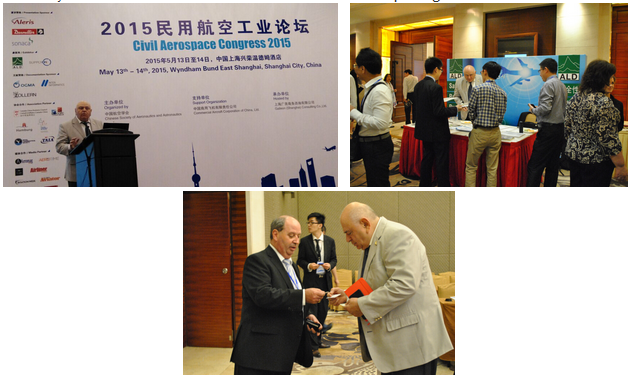 During May 13th - 14th, 2015, Civil Aerospace Congress 2015, organized by Chinese Society of Aeronautics and Astronautics, supported by Commercial Aircraft Corporation of China, Ltd. (COMAC) and hosted by Galleon (Shanghai) Consulting Co., Ltd. was successfully held in Shanghai. The leader of Chinese Society of Aeronautics and Astronautics delivered the opening address. The opening speech of the Civil Aviation Congress this year was given by Dr. Zigmund Bluvband, one of the world leading experts of reliability and safety of aerospace. The topic of his speech was the value of reliability and the importance of Reliability Data Sharing. Dr. Bluvband explained how an enlarged MMEL can increase the MDR( Maintenance Dispatch Reliability) of an aircraft. Dr. Bluvband demonstrated how ESRA (Expert System for Reliability in Aeronautics) is operating by gathering and sharing reliability stakeholders data. These solutions, as it was further elaborated, will be able to have a significant effect on the dispatch reliability of commercial aircraft. According to the key field and direction as specified in Decision of the State Council in Accelerating the Cultivation and Development of Strategic Emerging Industry, the key direction for development of advanced equipment manufacturing industry at this stage mainly includes: Aeronautic equipment, satellite and application, railway transportation equipment, ocean engineering equipment, intelligent manufacturing. On the first day, WANG Zhonghong, Senior Researcher from Development Research Center, the State Council made a lecture to event attendees with the topic “Development Features of High-end Equipment Manufacturing Industry in China under the New Normal State of Economy”. WANG said Guided by high and new technology, advanced equipment manufacturing industry is at the higher end of the value chain and in the core link of industrial chain, which drives the industrial transformation and upgrading. By 2020, the proportion of sales revenue of advanced equipment manufacturing industry in equipment manufacturing industry will be raised to 25% and the advanced equipment manufacturing industry will be cultivated to be the pillar of the national economy. As a high-tech strategic plan, German academic and industrial circles considered “Industry 4.0” concept as 4th industrial revolution mainly focusing on intelligent manufacturing or a revolutionary production approach. At present, Sino German cooperation on “Industry 4.0” had been into a new era. Dr. Stefan BERNDES, Head of Air Transport, Equipment and Materials from Bundesverband der Deutschen Luft-und Raumfahrtindustrie e.V. (BDLI) introduced interpretation of “Industry 4.0” and its impact on aviation manufacturing industry. Dr. BERNDES showed that aviation would be developed as a specific form of “Industry 4.0”. For civil aviation, the final purpose customers seeking was how to make integration under intelligent ways and how to further improve outputs and additional value with using capital. Leading European players of the Aerospace Industry jointly created a Collaboration Platform for the digitalization of the industry which was from individual Supply Chain Portals to a unique Aerospace and Defense Digital Supply Chain Platform. On the second day, CHEN Young, Chief Designer of ARJ21-700 Project from Commercial Aircraft Corporation of China Ltd. presented ARJ21-700 development through introducing overview of ARJ21-700 aircraft, certification summary, development data, and development history of domestic jet aircraft. Then, YAO Xionghua, Deputy Chief Designer from AVIC Aircraft Research and Development Center, talked about physical design of new turboprop regional aircraft under demand drawing, coast control and modest innovation through three parts including development situations, development demand of future market on structure and moderately innovated structure design of new-type turboprop regional aircraft. JIANG Zhuoyuan, Deputy Chief Engineer from COMAC Flight Test Center delivered a speech of “Risk Control Technology for Test Flight of Modern Civil Aircraft”. JIANG indicated that new situation of test flight of modern civil aircraft incorporated application of more new technologies, continuously updated safety management standard, change of the concept of flight test which was from “Find problems through tests” to “Confirm performance through tests”, from “Explore the unknown, and perfect the theory” to “Verify the theory, and optimize the algorithm”. In addition, top three breakthrough directions of modern civil aircraft test flight were planning of the whole cycle of flight test, flight test risk assessment and real-time support during flight. Furthermore, with the theme “Integration of Aircraft Designing and Fabrication”, the event set a panel discussion whose panelists were leaders and experts from Boeing China, COMAC, COMAC Shanghai Aircraft Manufacturing Co.,, AVIC Xi’an Aircraft Industry Co., and Atkins. When mentioning how to remark the first step of “Industry 4.0” application, QIU Xi, Chief Technologist for MA700 from AVIC Xi’an Aircraft Industry Co., said that “Industry 4.0” couldn’t make it without two concepts which were cloud and intelligence. Intelligent manufacturing would be also referred to when talking about China Manufacturing 2025. Whereby, multi suppliers should cooperate together on cloud manufacturing. Not only did the include raw material suppliers but also related finished product system suppliers and airframe structure suppliers. These suppliers should be based on networking and shared one resource based on their respective capabilities and characteristics. For intelligent manufacturing, its core was informatization approach to production line which meant intelligent ways should be used on information collection and dispose, and final verification and acceptance. CHEN Yong added that “Industry 4.0” should improve internet connection. For global co-ordination ARJ project, from big data, effective data resource and data analyzing means could be established through collecting malfunctions in aircraft manufacturing, delivery and operation phases in order to provide aircraft demand analyzing support. This event, lasting for two days, attracted over 150 leaders and experts from foreign and domestic Aircraft OEMs through speech, panel, communication, exhibition and one-to-one meeting. 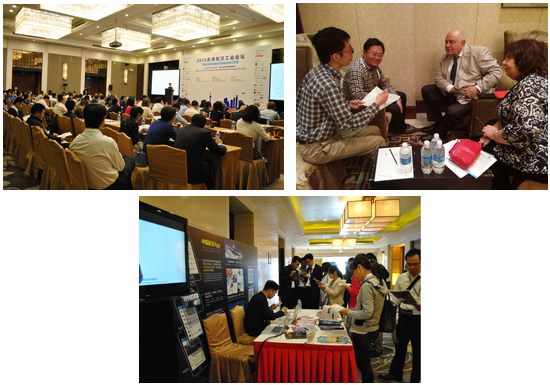 Let’s look forward to next aerospace manufacturing event!